There's more to this prize-winning chatbot than meets the eye. Take a look at how this one project makes use of serverless architecture to help DevOps teams. marbot forwards alerts from AWS to your DevOps team via Slack. It was one of the winners of the AWS Serverless Chatbot Competition in 2016. Today, I want to show you how marbot works and what we've learned so far. Let’s start with the architecture diagram. AWS SNS: Our users use SNS topics with an HTTPS subscription to transport alerts, notifications, and incidents from within their AWS accounts to marbot. At this point of writing, marbot can integrate with CloudWatch Alarms, CloudWatch Events, Budget Notifications, Auto Scaling Notifications, and Elastic Beanstalk notifications. Everything else is interpreted by the generic integration. Non-AWS sources that make HTTPS calls like New Relic, Uptime Robot, or just curl clients. Slack: marbot uses the Slack Events API to drive conversations with his users and Slack Buttons to allow users to acknowledge, close, or pass alerts. The API Gateway forwards HTTP requests to one of our Lambda functions. All of them are implemented in Node.js and store their state in DynamoDB tables. One special case is the Slack Button API. When you press a button in a Slack message, marbot has 2 seconds to respond to this message. To respond to a button press, marbot may need to make a bunch of calls to the Slack API. 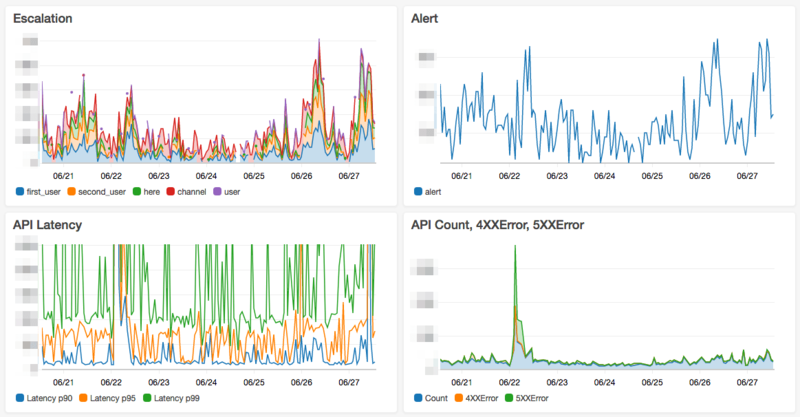 We learned that we miss the 2-second timeout very often by looking at our CloudWatch data. To not miss the 2-second timeout, we now only put a record into a Kinesis stream that contains all relevant data before we respond to the API request. Writing to Kinesis is a quick operation, and we haven’t seen 2-second timeouts since we switched to Kinesis streams. As soon as possible we read the Kinesis stream and process the records within a Lambda function. Kinesis comes with its challenges. If you fail to process a record, the Lambda Kinesis integration will retry this record as long as the record is deleted from the stream. All the newer records will not be processed until the failed record is deleted or you fix the bug! So we decided to use Kinesis knowing that an error can stop our whole processing pipeline. Retry on failures like timeouts or 5XX responses. The following screenshot shows an X-Ray trace where the code retried Slack API calls because of the 3 seconds timeout. For every alert that arrives in marbot, we keep a timer. 5 minutes after the alert is received, we check if someone acknowledged the alert. If not, we escalate the alert to another engineer or the whole team. We have decided to use SQS queues for that. If you send a message to an SQS queue, you can set a delay. Only after the delay, the message becomes visible in the queue. Exactly what we need! The only downside to this solution is that there is no native way to connect Lambda and SQS. But with a few lines of code, you can implement this on your own. Make sure to put config_plain.json into your .gitignore file! Using this approach, you will only make one API call to KMS (for every Lambda runtime). We use a CloudWatch Dashboard to display those business metrics together with some technical metrics. Jenkins runs the pipeline. Since our code is hosted on BitBucket, we can not easily use CodePipeline at the moment.